PCE Instruments' accurate, affordable paint gauge, thickness meter, surface testing and film gauge devices are used for material testing, manufacturing quality control and automotive paint inspection applications. Choose from a variety of paint gauge, mil gage or paint meter products used for the non-destructive measurement of nonmagnetic coating, insulating layer and dry film thickness (DFT) on ferrous and / or non-ferrous metal substrates such as steel and aluminum. A paint gauge is an essential quality assurance tool when anodizing, galvanizing and applying zinc coating to metallic surfaces. A coating thickness gauge also is used to measure body paint thickness and uniformity on pre-owned cars, revealing repainted spots, identifying hidden damages and exposing undisclosed accidents. This information is important when determining the actual value of a used car. In addition, certain types of thickness gauges can measure wall thickness and determine the hardness of metals, plastics and glass. PCE-CT 65 is a paint thickness gauge that uses magnetic induction (ferrous) or eddy current (non-ferrous) to take non-destructive measurements of coating and dry film thickness (DFT) on metal substrates such as steel and aluminum. This thickness gauge is ideal for painted and powder-coated surface testing, automotive paint inspection, coated material testing, and manufacturing quality control applications. PCE-CT 100 is a paint and coating thickness measuring instrument used to quickly and easily determine coating thicknesses on ferrous (Fe) and non-ferrous (nFe) metals. This compact handheld coating thickness gauge uses magnetic induction (ISO 2178) and eddy current (ISO 2360) coating thickness measurement methods to take non-destructive measurements of coating and dry film thickness (DFT) on metal substrates such as steel and aluminum. PCE-CT 5000H is a paint thickness measuring instrument used for the rapid determination of coating thicknesses on ferrous (Type F) and non-ferrous (Type N) metals. 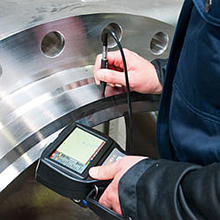 The paint and coating thickness gauge automatically detects the type of metal to be measured. PCE-CT 5000H is a paint thickness measuring instrument used for the rapid determination of coating thicknesses on ferrous (Type F) and non-ferrous (Type N) metals. The paint thickness gauge automatically detects the type of metal to be measured. The PCE-CT 28 Paint Gauge for cars is for measuring the thickness of paint and plastic on ferrous or non-ferrous materials without damaging the coating's surface. The Paint Gauge stands out due to its high range of measurement. The PCE-CT 28 Paint Thickness Gauge for cars is for measuring the thickness of paint and plastic on ferrous or non-ferrous materials without damaging the coating's surface. The Paint Thickness Gauge stands out due to its high range of measurement. PCE-CT 27FN is a Paint Gauge that takes non-destructive measurements of nonmagnetic coating, insulating layer and dry film thickness (DFT) on metal substrates such as steel and aluminum. Ideal for surface testing, automotive paint inspection, material testing and manufacturing quality control applications. PCE-CT 27FN is a Paint Thickness Gauge that takes non-destructive measurements of nonmagnetic coating, insulating layer and dry film thickness (DFT) on metal substrates such as steel and aluminum. Ideal for surface testing, automotive paint inspection, material testing and manufacturing quality control applications. The PCE-CT 5000 Paint Gauge is an instrument for a nondestructive thickness measurement of coatings, such as varnishes, paints, etc. on steel / iron and non-ferrous metals. The extremely wide measuring range of the Paint Gauge goes up to 5000 µm or 200 mils. Gumming or plastic coatings for shock and impact protection can be controlled just as the thin paint coatings. The PCE-CT 5000 Paint Thickness Gauge is an instrument for a nondestructive thickness measurement of coatings, such as varnishes, paints, etc. on steel / iron and non-ferrous metals. The extremely wide measuring range of the Paint Thickness Gauge goes up to 5000 µm or 200 mils. Gumming or plastic coatings for shock and impact protection can be controlled just as the thin paint coatings. The PCE-CT 40 is a Paint Tester that takes non-destructive measurements of nonmagnetic coating, insulating layer and dry film thickness (DFT) on only ferrous metal substrates such as steel. Ideal for surface testing, automotive paint inspection, material testing and manufacturing quality control applications. PCE-CT 50 is a Paint Tester that takes non-destructive measurements of nonmagnetic coating, insulating layer and dry film thickness (DFT) on only non-ferrous metal substrates such as aluminum, brass, stainless steel and anodized aluminum. Ideal for surface testing, automotive paint inspection, material testing and manufacturing quality control applications. The PCE-CT 30 is a Paint Tester that takes non-destructive measurements of nonmagnetic coating, insulating layer and dry film thickness (DFT) on metal substrates such as steel and aluminum. Ideal for surface testing, automotive paint inspection, material testing and manufacturing quality control applications. The PCE-CT 25 Paint Gauge is used for quickly detecting the thickness of metals, such as steel and iron (F) as well as non-ferrous metals (N) in the automotive sector. The PCE-CT 25 Paint Gauge is used to detect damages in cars (the coating thickness of paint can say if the car has suffered any damage) to establish if the car has been in an accident and the resulting value of the car in the used car market. Why buy a paint gauge? Paint thickness measurement is an important part of quality assurance. A coating of paint that looks good does not always turn out to be of a good quality. A number of products fresh off the assembly line have very attractive, shiny or matte surfaces, but over time exposure to light, hot and cold temperatures, and vibration can cause gloss to fade and paint to crack. Therefore, high-quality coatings should not be underestimated, since coatings affect not only a product's appearance but also such aspects as performance and service life. By paying attention to the thickness and quality of a coating from the beginning, unnecessary repairs can be avoided later on. To check how thick a coating is on a particular substrate, a special device called a paint gauge or coating thickness meter is used. A substrate can be anything from ferrous or non-ferrous metal to plastic, glass or wood. Coating thickness measurement is the determination of the layer depth of a coating or film on a particular substrate. Coating thickness can be measured when the paint or film is wet or dry. However, non-destructive coating thickness measurement must be performed when the film or coating is dry. Most substrates are typically a ferrous metal (e.g., steel or iron) or a non-ferrous metal (e.g., aluminum or copper). In some cases, coating thickness must be measured on non-metal substrates such as wood, glass or plastic. In these instances, an ultrasonic paint gauge is recommended, as a traditional dry film coating thickness gauge uses a magnetic or eddy current measuring technique. Most eddy current or magnetic paint gauge products are dual purpose, meaning the gauges are suitable for measuring coating thickness on both ferrous metals and non-ferrous metals. These versatile coating thickness meter devices usually offer a wide measuring range. Where is a paint gauge used? Paint thickness measurement is performed frequently in the automotive industry. During automobile manufacturing and production, a paint gauge is used to determine whether enough paint or gloss has been applied to various parts and surfaces. Car dealerships, auto body repair shops and car insurance claims investigators also use coating thickness meter devices to identify variations in vehicle paint jobs signaling prior accidents. In addition, a paint thickness measuring instrument can be used to inspect the application and wear of corrosion-resistant protective coatings on metals (e.g., hot-dipped galvanized zinc on steel beams). 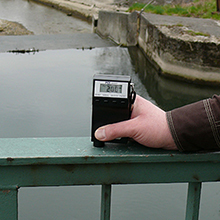 Thus, a handheld coating or layer thickness meter is a valuable tool used by building, bridge, oil tanker, gas pipeline and petrochemical plant inspectors for corrosion monitoring. 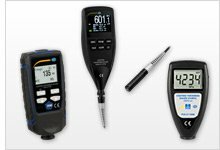 If you have questions regarding a specific application, the friendly and knowledgeable technical support staff at PCE Instruments will assist you in finding the right oaint gauge for the task at hand. Simply contact or +44 (0) 2380 987 035 for PCE Instruments UK, or or +1 (561) 320-9162 for PCE Americas Inc. The sensor of a paint gauge either can be found inside the unit or within a separate probe. A paint gauge with a built-in or internal sensor is ideal for quick, on-the-spot measurements in the field or on the production floor. This style of paint gauge often comes pocket-sized or designed to be conveniently portable. A paint gauge with an external sensor probe is better for taking measurements in small spaces with limited access. Some paint gauge devices come with memory for saving measurement data. When the memory is internal or built into device, the saved measurement data usually can be transferred to a computer via a USB port or RS-232 interface. In addition to a connection cable, software may be required for data transfer. Please review the specifications of each paint gauge carefully before buying to ensure all necessary components are purchased. Often more is involved in the budget than just the cost of the paint gauge. 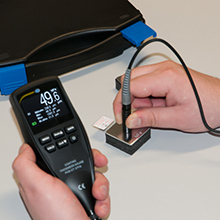 Calibration costs are common expenses that can occur when using a paint thickness measuring device. For instance, if you need to meet the requirements of an ISO quality standard, a regular calibration interval needs to be adhered to. ISO calibration costs can occur at the time of purchase and reoccur on an annual or even semi-annual basis, depending on your accuracy needs and usage of the paint gauge. It is also possible that recalibration becomes necessary later on, due to the drift sensors can experience over time. Consumables like (rechargeable) batteries should be included in your calculations as well. Should you have any questions about paint thickness measurement using a paint gauge, please do not hesitate to contact the PCE technical sales and support team at or +44 (0) 2380 987 035 for PCE Instruments UK, or at or +1 (561) 320-9162 for PCE Americas Inc.